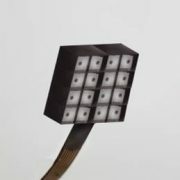 Within the DAKARA project an ultra-compact, energy-efficient and reconfigurable camera matrix is developed. In addition to standard color images, it provides accurate depth information in real-time, providing the basis for various applications in the automotive industry (autonomous driving), production and many more. The ultra-compact camera matrix is composed of 4x4 single cameras on a wafer and is equipped with a wafer-level optics, resulting in an extremely compact design of approx. 10 x 10 x 3 mm. This is made possible by the innovative camera technology of the AMS Sensors Germany GmbH. The configuration as a camera matrix captures the scene from sixteen slightly displaced perspectives and thus allows the scene geometry (a depth image) to be calculated from these by means of the light field principle. Because such calculations are very high-intensity, close integration of the camera matrix with an efficient, embedded processor is required to enable real-time applications. The depth image calculations, which are researched and developed by GraphicsMedia.net partner DFKI (Department Augmented Vision), can be carried out in real-time in the electronic functional level of the camera system in a manner that is resource-conserving and real-time. Potential applications benefit significantly from the fact that the depth information is made available to them in addition to the color information without further calculations on the user side. Thanks to the ultra-compact design, it is possible to integrate the new camera into very small and / or filigree components and use it as a non-contact sensor. The structure of the camera matrix is reconfigurable so that a more specific layout can be used depending on the application. In addition, the depth image computation can also be reconfigured and thus respond to certain requirements for the depth information. For more information, visit av.dfki.de/projects/dakara/.